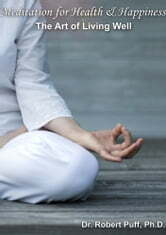 In his book, "Meditation for Health and Happiness", Dr. Robert Puff discusses the importance of practicing daily meditation. Sharing findings from numerous research studies conducted by scientists and psychologists all over the country, Dr. Puff talks about the long-term effects of stress on the body and mind; and how meditating regularly can heal everything from high blood pressure, heart palpitations, and back pain, to mental depression and anxiety. Not only will Dr. Puff talk you through a very basic and easy meditation, you will learn about the history of meditation, and how it has been incorporated into nearly all of the world's great religions. Whether you're new to meditation or you have meditated for years, you'll find this book both fascinating and informative. Worth while, easy reading and very informative. Just what you need while trying to work out how to find happiness. Short and sweet. Very informative in the most simplest way! This book gives a wonderful outline of the basis for meditating, touching on the many health benefits for the body . I know from experience that when I go to a doctor , my blood pressure goes sky high in anticipation of the results of tests. After talking to the doctor , about my blood pressure, she leaves the room for 5 minutes so I can meditate when she returns my blood pressure is back to normal. I realize that I need to meditate for longer periods so I can control my blood pressure at all times! I assumed this this man was in hogwarts, specifically in the house hufflepuff. I must admit i was quiet dissapointed.